Discard 1 card, then target 1 "Super Quantum" monster you control; Special Summon from your Extra Deck, 1 "Super Quantal Mech Beast" Xyz Monster with the same Attribute as that monster you control by using it as the Xyz Material. (This Special Summon is treated as an Xyz Summon.) 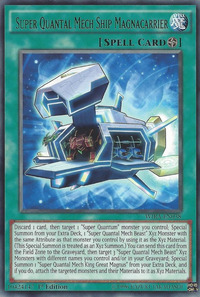 You can send this card from the Field Zone to the Graveyard, then target 3 "Super Quantal Mech Beast" Xyz Monsters with different names you control and/or in your Graveyard; Special Summon 1 "Super Quantal Mech King Great Magnus" from your Extra Deck, and if you do, attach the targeted monsters and their Materials to it as Xyz Materials. Super Quantal Mech Beast Aeroboros, Super Quantal Mech Beast Magnaliger and Super Quantal Mech Beast Grampulse appears in this card's artwork. This card is based off of the in /.